3.3 What is Bokeh and How Does it Work on iPhone 7 Plus? 3.5	How to Use iPhone 7 Plus’s Dual Lens Camera? Note: iPhoto has discontinued to update since 2015. However, you still can download and use it in Apple offocial website. You want to make your wedding/ anniversary or childhood or birthdays of your children remembered by making a slideshow of the photos. It can make the nostalgic feeling to you when it’s a bad time for missing your past days, or it can be another mean for enjoying with family. 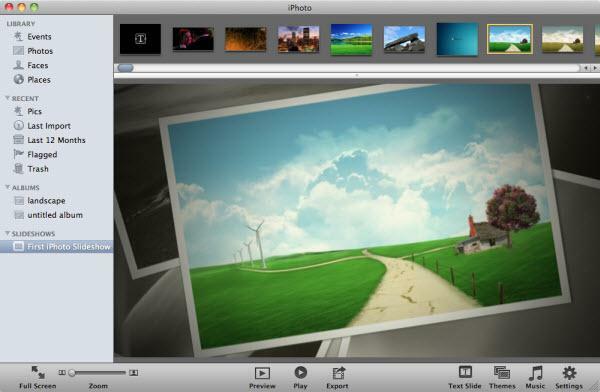 iPhoto is very much easier to handle for making a slideshow. 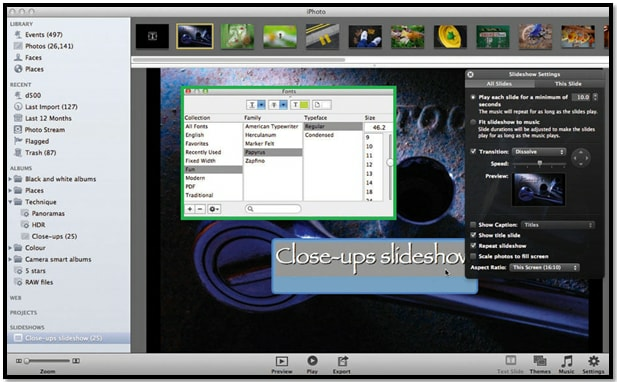 This software comes with some pre-installed themes for slideshows, and you can add photos to them to have the slideshow prepared. Here is a iPhoto slideshow tutorial to show you how to make a iPhoto slideshow, and play on TV including your Apple TV in details. 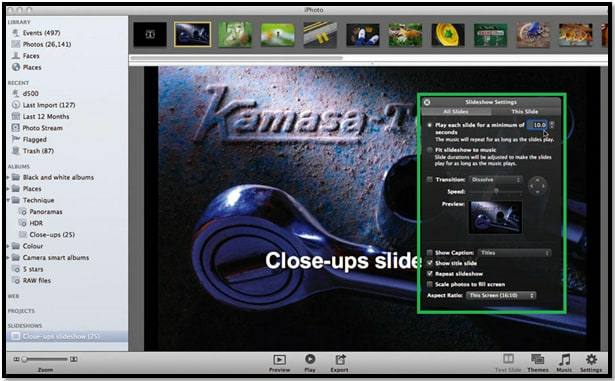 iPhoto '11 makes is easier to make a slide show. Just select the photos that you want to include in the slideshow, and choose New Slideshow from File menu. You could then type a name for the new created slideshow under SLIDESHOW category. 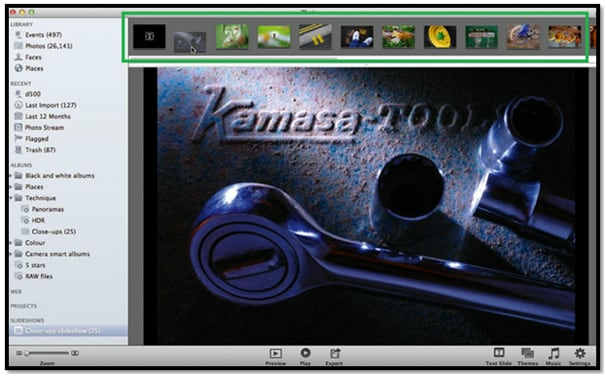 As iPhoto includes some themes for you to make slideshow in pre-design styles, click Themes button to browse slideshow themes in a new windows and select the favorite one. Click Choose button to apply. You can drag and drop photos on top to re-arrange the photos. Thus you're done. 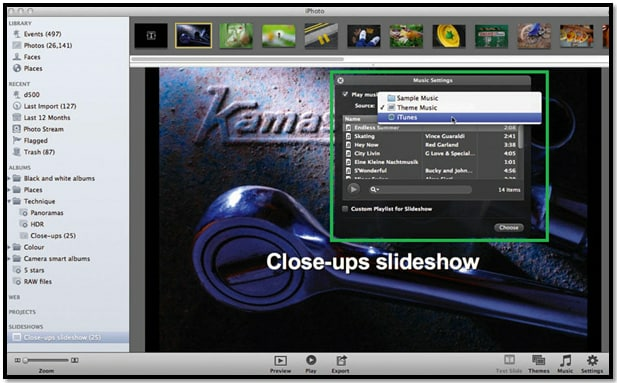 From what has been discussed above, you can get a slideshow using the default labelled themes in iPhoto for slideshow. However, the addition of music and Settings properties are discussed broadly in further instructions. Select a new slideshow from the source panel. You can get the photos for the slideshow in a film strip at the upper part of the window. You can manage the order or sequence of the slide just only by dragging the preferred images by the thumbnails from the photo order in the film strip. After changing the order of one photo, it will shuffle the rests. You can get the Music settings bar to manage the audio files for the slideshow by clicking the Music button at the bottom right part of the window. You need to select drop down files from the source menu to find the music files in drive that you need to use. You can get some built-in tunes for slideshow, or you can select from the library in iTunes from your favourite Mac. You need to choose the Settings button, and you can make some differences here by only choosing music. You can customize the duration for a photo of the slideshow to be displayed, or you can assemble your photos onto the length of the audio track when you will allow the audio file to be played in the slideshow background. You can get a drop down menu for the transition by clicking on the transition box. The default transition is set to the “Dissolve” mode. But you can choose more transitions from the options. The “Fade Through Black” transition is much effective for slideshow. You can manage or adjust the properties of the transitions from the previewed dialog menu. 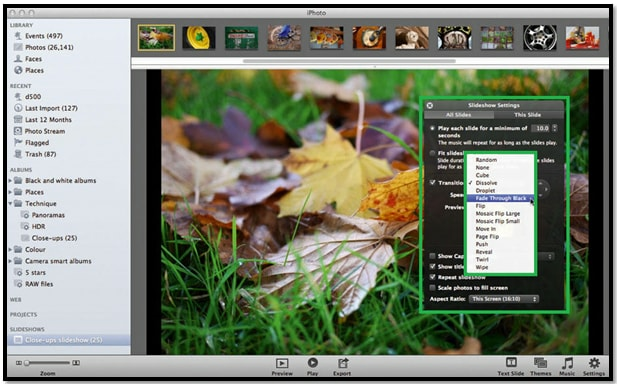 From the slideshow setting panel, you can get the title manager or rename option of All Slides menu for all photos at once or for every photo you can choose This Slide menu at the top of the panel. These will give you the opportunity to choose the setting for all photos or selected one but often it will prove you a novice in choosing the different transition for different photos. You can add more information like other descriptions, date and title, etc. for your pictures in the slideshow. What is the title slide? You can add a title that will be preview in the slideshow at the beginning and get attached with the first photo. The position of the slide title cannot be changed, but the font style can be changed easily from the following instructions. Use Command+T to have the Fonts panel to be displayed. Now change the Fonts Style for the Title Slide. There are some other menus at the bottom of the Settings panel. 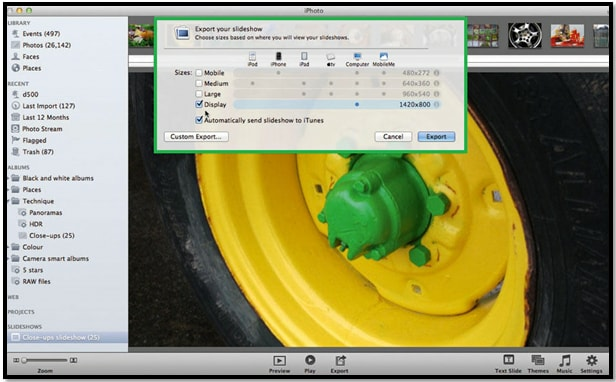 The way or pattern you need to sort your photos to be displayed can be checked from “Scale Photos to Fit Screen”. This menu will avoid the black bars from the sides of your photos. But you need to remember that this option is dependent to the device you will use for playback the slideshow. From the iPhoto Slideshow, you can get the 16:10 aspect ratio as the default option. But when you are playing it to a Widescreen TV or monitor, you need to change the Screen size to the aspect ratio 16:9 and you need to choose the suitable screen size for your iPhone or iPod Mini or iPad to play on it. The movie size may not be fit for the devices and it may unnecessarily large. So you need to select the dimensions according to the specific device. 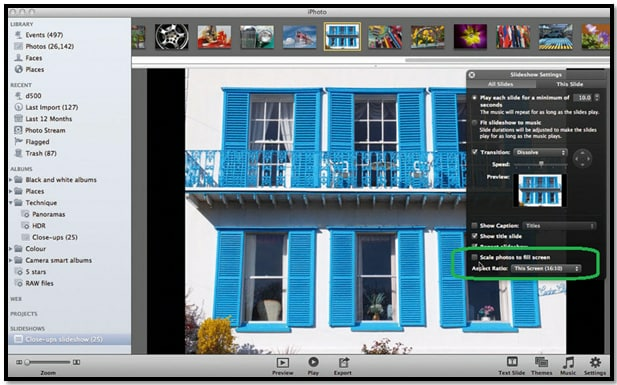 You need to click to the Export button that can be found at the bottom of the window of iPhoto. Here you can manage the dimensions for movie according to the device properties. The above steps can get you a very easy, fast and comprehensive slideshow for your photos suitable for the playback device. Get attached with the instructions and add your best perceptive knowledge to get the best taste from the slideshow. 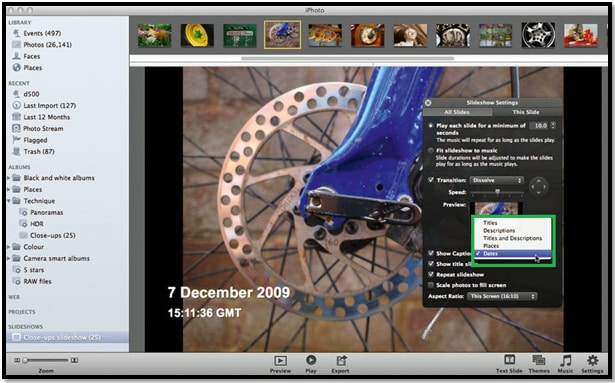 To watch iPhoto slideshow on Apple TV, you can sync iPhoto slideshow to Apple TV with iTunes. 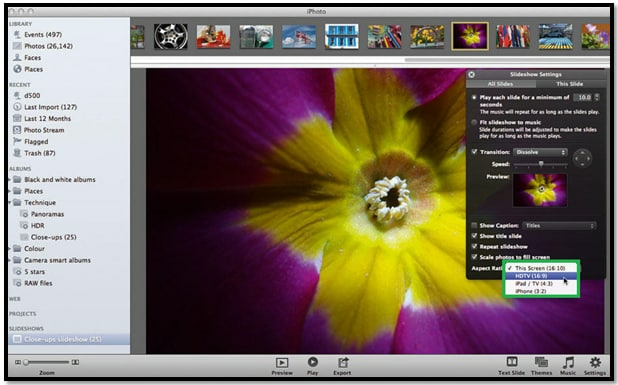 To export the slideshow to iTunes, first select Export from File menu and go to Slideshow tab. Select AppleTV and finally click Export button to start the creation. Tip: If you selected the "Automatically send slideshow to iTunes" option, the exported Slideshow will be added to iTunes, which allows you to sync iPhoto slideshow to Apple TV for playback. Once your Apple TV has correctly connected to your Mac, you could find it under DEVICES in iTunes. Choose it and go to Movies tab to transfer iPhoto slideshow to ATV. See how to connect your Apple TV by cables. 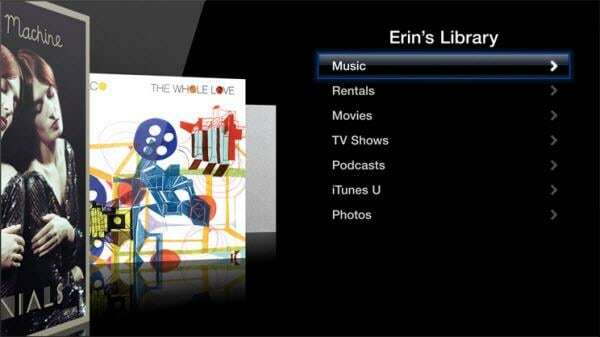 Now you've got the iPhoto slideshow on your Apple TV, you can easily find it from the TV menu and play it like a charm. Taking Apple TV 2nd generation for example, you can go to "Computers" on your Apple TV menu, find the iPhoto slideshow video you've synced to Apple TV, select it to play. I've never heard about this software. But if to talk about applications for streaming different kinds of media from you iphone to different devices, I read lots of positive reviews about ArkMC.